Arizona gardening has some challenges. Here are some tips if you are not sure of what to do once the temperature soars above 100º F. Use the following gardening calendar as your “How To Garden in the Low Desert” resource for each month of the year. January will generally be a slow month for gardening in the low desert. Take advantage of this to get ready for the forthcoming spring months. Plan your garden or landscaping projects. January is a good time to prepare a new vegetable garden bed for spring planting. Prepare your vegetable bed using a digging fork or rototilling about 12-18 inches deep. Do not work the soil if it is moist. It can easily damage the soil structure. Utilize several inches of compost and incorporate it into the loosened soil. For those with an established vegetable garden, this is also a good time to add more compost. In February be ready for occasional frosts. Take needed frost protection measures. Don’t allow a warm few days in February to fool you into believing spring has arrived. The low-desert can easily have evenings with freezing conditions throughout the month. Mesquites may well seep an amber-colored resin during February. This is normal however, it could be signaling an injury to the tree. The exudates are usually sweet smelling and flavored. If the exudates are dark in color, gluey and odiferous it suggests a bacterial infection called slime flux. You can trim affected branches, but once it has been infected the tree will remain diseased. It may take many years, but the tree will eventually die. When March arrives, spring is in the air. Or is it? It still is possible to have freezing temperatures early in the month, so don’t store your frost protection material just yet. By the middle of March, chances of freezing temperatures are low. It is time to start your spring gardening tasks. This is a good perfect time to divide clump-forming Agave, Aloe, Manfreda, Hesperaloe, and Candelilla in the landscape or in containers. Many deciduous trees will begin to produce new foliage as the weather becomes much warmer. This includes Mesquites, Desert-willow, Golden Leadball Tree, Feather Tree, and Kidneywood. Stem and flower buds are forming on many cacti at this particular time. Look for these buds on Prickly-pears, Chollas, and Hedgehogs. In April, the desert comes alive with colors, fragrances, and noises. When the fall and winter months rains are plentiful, a dazzling variety of color will cover the desert floor. Many annuals such as Mexican Gold Poppies, Owl-clover, Lupines, Yellow Evening Primrose, Bladderpod, Scorpionweeds, Chia, and Desert Pincushion. The spring blooming season is now coming to an end as the temperatures begin to increase and the impending summer is fast approaching. Numerous spring blooming annual wildflowers have gone to seed. You can gather the seed and store in paper bags until fall or let plants to reseed in the landscape. Rake up the dead annuals or cut them back. Don’t just pull them from the ground. It is better not to disturb the soil by pulling the plants out. Cutting them will allow the surviving root system to decompose naturally. The foliagee of the Boojum Tree and Elephant Tree will continue to yellow and fall. The Boojum Tree and Elephant Tree will be summer-dormant. Periods of active growing begin from about November thru May. When the leaves of both succulents begin to fall, less water is needed. June in the low desert begins the period of higher day time temperatures. Evenings will still be cooler. Desert gardeners will begin their garden activities in the early morning or at sunset to avoid the intense sunlight. Plants must endure the rigorous heat for the duration of the day. Many native and desert plants have made countless adaptations to live successfully in the desert. Even with these numerous adaptations, desert plants often need a little help in order to keep them healthy and flourishing in your garden. Even native and desert-adapted plants that were newly planted will need proper watering until they become established. Once established in the landscape. they will be able survive with natural rainfall. Even established plantings will require an occasional supplemental watering during lengthy periods of drought. July signals the the arrival of summer and the hoped for monsoon rains. The monsoon season provides much relief to both vegetation and animals. However, you will likely notice many of the non-native succulent plants succumbing to higher night time temperatures. When the night time temperatures stay at 90º F or above and the humidity is high, the majority of succulent plants can not breathe. After several such nights in a row, it is highly likely many of them will rot. Other than careful watering, there is practically nothing that can be done. Native summer annuals can be planted from seeds at this time. These include Arizona Poppy, Chinchweed and Devil’s Claw. These annuals can be hard to germinate, but drenching the seed overnight in water will kick start the germination process. August in Arizona is the point in time when we all begin to wonder when the summer will end. Unfortunately, we have about two more months to endure. Monsoons clouds continue to build in the afternoons. The humidity is increasing and raindrops start falling during the mid afternoons. During August you will continue to notice that your succulent plants are succumbing to higher night time temperatures. The higher night time temperatures and humidity takes it toll. Many will rot. There is nothing that can be done. September is the beginning of the end of the higher temperatures. By the end of September, day time temperatures will lower and evenings become cooler. Monsoons end and humidity levels start to drop. Now is the period to begin preparing for your wildflowers, annual herbs and vegetables. Prepare your list and head to the nearest fall plant sale. Keep watching for yellowing of cacti and succulents. The sun’s position continues lowering, however shade cloth will be needed for another month. Plants that are summer dormant will likely begin to leaf out towards the end of the month. Collect seeds from your perennials during this time period. Continue weeding or at the very least cut off the flowering heads before they go to seed. If you planned your vegetable garden last month you are ready to get started. Finding plant sales is also a great opportunity to chat with the experts on desert plants and gardening. Not to mention finding an array of desert-adapted trees, shrubs, cacti, succulents and perennials to choose from. The monsoon moisture is gone and drier air and cooler nights are the norm. The first half of the month will probably still be warm with day time temps in the high 80’s and low 90’s. Breathe a sigh of relief along with your garden! Start removing the shade cloth that you might have placed to protect plants from damaging rays of the intense summer sun. They can be on their own now. November is the time to begin planning for frost occurrences depending on where you are in Arizona. Historically, the very first freeze can happen as early as the November 15 in northern Arizona. Buy and/or stage your frost protection so that if and when an event occurs, you are prepared. Use a fabric such as N-Sulate, burlap or old sheets. Do not use plastic. Plastic causes plants to burn where they come into contact with it. Frost cloth such as N-Sulate can be found at a variety of garden facilities. Local gardening centers will most likely sell it by the yard, foot or in bulk rolls. N-Sulate is a medium-weight, permeable, UV-treated cloth that is reusable. When used correctly, it adds a number of degrees of heat underneath. Drape material so it meets the ground around the edge of the plant in order to trap warm air and any heat radiating from the ground. N-Sulate frost cloth does have about a 30% shade factor, so although it can be left on for several days in a row, do not leave it on the plants the entire winter or long periods of time. The first half of December is normally fairly mild. Colder weather is more likely during the second half of the month. Any frost sensitive plants in containers should have been brought in under cover of a patio. Be sure to use frost protection to plants that can’t with stand colder temps. Use a material such as N-Sulate, burlap or old sheets; never use plastic as it causes plants to burn where they come into contact with it. Well there you have it. Arizona gardening tips for each month of the year. We hope it gives you the information you need and makes your gardening a success. 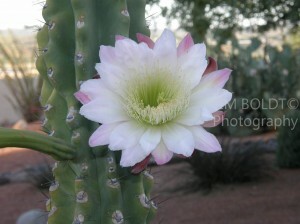 For even more information on Arizona Gardening check out this Tucson landscapers website. By the way. If you are considering Tucson Arizona as a place to live or looking for Tucson Arizona real estate, we can help.